To add a little excitement we had a tornado alert right about the time we were sitting down to eat lunch so we took our food into a hallway with no windows, sat on the floor to eat, then talked about what needs to happen to make fabric for clothing. By the time we finished that the alert was downgraded to warning and we went back to the classroom. 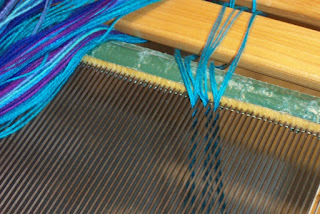 It was great fun as always to put faces to names, meet a previous student again and just generally encouraging new (and not so new) weavers to learn techniques new to them. Hopefully they will go home and feel a little more confident about the rather complex process involved in getting a warp on the loom. Tomorrow we head north to Chattanooga, then Nashville on Friday. This morning we will wrap up, have lunch and head for home. Or, in my case, on to Atlanta. I forget how many are signed up at the workshop at SEFAA, but that doesn't matter. I know that I will meet some great people. And if I can help some of them weave with fewer difficulties and enjoy the process more the stress of travelling and being away from home is all worth it. Putting faces to names I may have only seen on the Internet makes the net more fun. The people behind the posts or emails become more 'real', so to speak. Those are real people with real challenges and lives beyond the chat groups. The sun has broken through and it's a lovely day. Students are making good progress weaving their samples. We will wet finish after dinner and wrap up tomorrow. The shuttle for Atlanta leaves at noon so this is a very fast paced class. This afternoon we are over the half way mark at the folk school. The sun has just broken through the clouds. Just in time for the session on colour. Found out when I arrived that instead of three in the weekend workshop there will be nine. Good thing I provided ten warps! Is dawning sunny and clear...but chilly. :). Glad I've got my warm coat. Today we have some errands to run and then Cindy will show me her Newcombe loom. I've heard about them but never seen one in real life, so I get to learn something new today. My peaceful interlude is just about over. Time to head to the Carolina's on Friday. Unfortunately the weather is rather nasty there so I am fervently hoping it will begin to clear so that there are no travel delays. It turned cool and rainy so we kept to the house. My friend worked on her various projects and I hemmed some of the towels in my suitcase. A lovely relaxing day. Back to the fray tomorrow. Could not fit more AGY Rayon into my suitcases so I won't have any to sell at the folkschool. Keeping fingers crossed the mail delivers the box to Atlanta for the rest of the trip! The last two days I've been making final arrangements for the trip - loading my suitcases, getting my vitamins and meds ready, ticking a few more items of administrivia off my list. Some things I'd hoped to get done will have to wait until I get home. 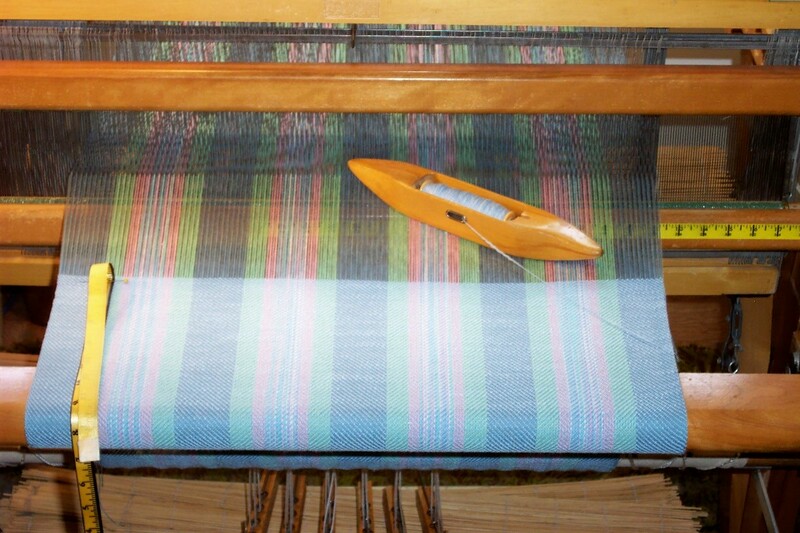 And that warp I'd planned to leave on the loom for when I get home? Um. Well. I finished it. Well, since I don't know what will be awaiting me when I get home, I guess having two nekkid looms isn't actually a bad thing? Anyway, I don't know how often I'll get to a computer so blog posts may not be very regular for the next 31 days. I ran out of the variegated yarn while winding the last stripe so when I threaded, I left off the corresponding number of ends from the outside stripe on the other side. Once is a design flaw. Twice is a design feature. I did several things in high school that have stood me in good stead as an adult. Law 11, was one. Office Practices (where I learned how to do double entry bookkeeping) was another. And interestingly, English 12 where I learned how to read for editorial slant. Editorial slant doesn't just apply to editorials in newspapers and magazines (or verbally on talk shows), but also to advertising. As for emotional trigger words, how about that lovely advertising chestnut 'anti-microbial'? We have been encouraged to buy (usually expensive) anti-microbial this and anti-microbial that with the end result that we are breeding super bugs. We learn to deal with adversity by dealing with adversity and our immune systems are being so overly protected from bugs/germs that our immune systems don't know what to do when they encounter diseases. So when the new bamboo rayon yarns first came on the market with claims of being anti-microbial, I dismissed that information as being irrelevant as to why I might choose to work with that particular yarn. Industry does not include that feature in its standard testing for fibre characteristics, so I didn't include anything about it in A Good Yarn: Rayon. So far as I can discover, rayon - from whatever source - is no more nor any less anti-microbial than any other cellulose fibre. When shopping for any product, try to filter out the emotional trigger words and focus on what is proven and pertinent to your choice. With dwindling inventory of the colours that most appeal to me it was time for a change of pace. Decided to do a more 'neutral' warp instead of the pastels or mid-range values I'd been playing with for the past couple of weeks. 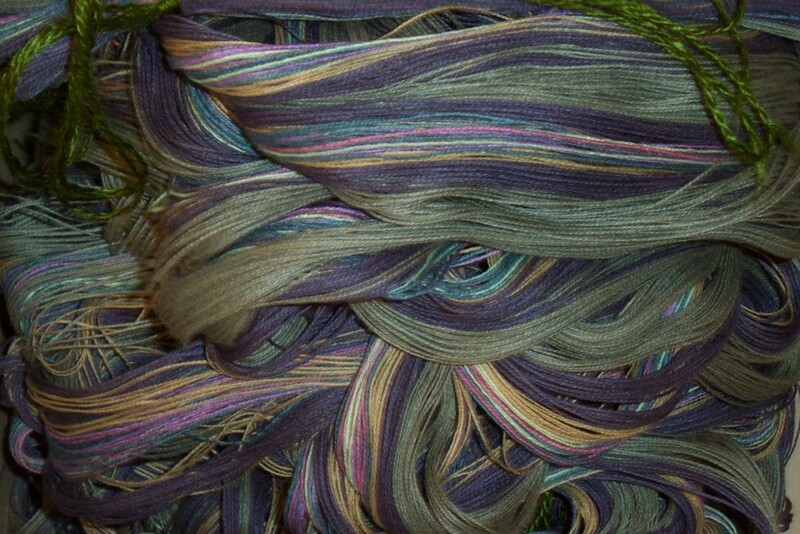 So here is the warp (or half of it). 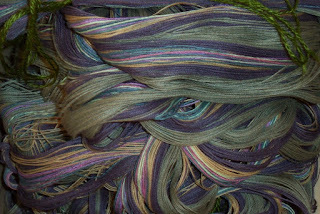 Kahki, a dusky plum, a touch of 'gold' and one of the variegated yarns. These are not 'my' colours but so far I'm really happy with how they look together. 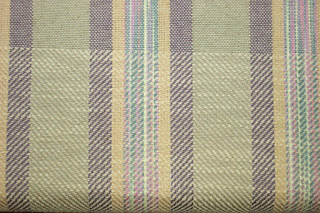 The weft will be a mid-range beige about the same value as the 'gold'. I also sent a box of Rayon to Atlanta so there will be copies of Cotton and Rayon available (in limited quantities, of course) during my trip. First come, first served. :) I will also have a few copies of Kerstin Fro:berg's Weave A V for anyone interested. If you are in TN, do stop by and say hello. I'm still dealing with the last minute administrivia that came my way this week - registering for the PST being one of them, getting my application (resume and reference letters) ready to email and finally placing my yarn order. I didn't worry about getting that in earlier this week as it will arrive while I am away and Doug will have to deal with it. But I do want it here when I get home so that if I can possibly get started weaving the samples, the yarn is here ready and waiting for me. Time will be very precious all during the rest of this year and there won't be any to spare - or waste! Today Staples is supposed to have the copies ready to be picked up. I'll go up there after massage to pick them up. Tonight I will number and sign the covers, write out the mailing labels and tomorrow Doug and I will drag everything up to the guild room where we can use the large tables to spread out and assemble/package the copies. By not supplying a three ring binder and flip-flopping the sample pages, I've managed to keep the package small enough to qualify for small packet status for delivery outside of Canada. This is a significant savings in terms of shipping so I hope people will bear with me and straighten out the pages when they get the package. For Canadians, the cheapest rate is expedited parcel - no small packet category within Canada. I've been having a lot of fun working with various colours and combinations with the variegated cotton yarns. And I needed more towel inventory, anyway, so it's all been good. But - in spite of my huge stash - I am running low on sufficient amounts of the colours I want to use so I can see another cotton yarn order in my future. 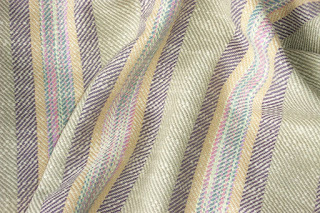 Well, I'll be placing a rather large order for the linen and hemp for A Good Yarn: Linen and Hemp today so the cotton yarns will have to wait until I get home and see what my schedule is going to look like in terms of weaving more towels. And another opportunity has knocked. In order to answer that knock I have to do something I haven't done in a very long time - draw up a resume to include with my application. Someone once observed that I was doing something in order to enhance my resume. I had to laugh at that because I'd given up keeping an up-to-date resume a few years previous to that comment. Quite frankly, making my resume look good is never in my thoughts when I choose to tackle something - or not. 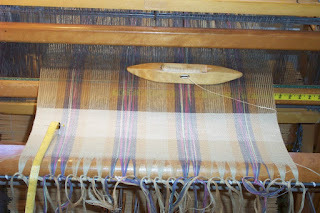 While weaving the rose towel warp I suddenly had a broken end, very near the end of the towel body. Truth be told, it was a knot in the warp I hadn't noticed while winding and the knot simply gave way. There are a number of ways to deal with such a situation. 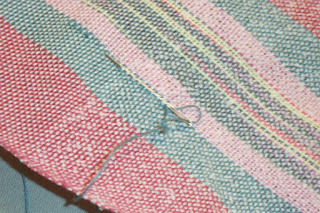 I was in a hurry and since it was so near the end of the towel, I simply tied another short bit of thread onto the loose end, threaded it back through the heddle and pinned the new end into the cloth. The repair knot will be below the fold, so I decided not to worry too much about it in that placement. If it had been within the towel body itself I would have hung a repair end off the back beam. 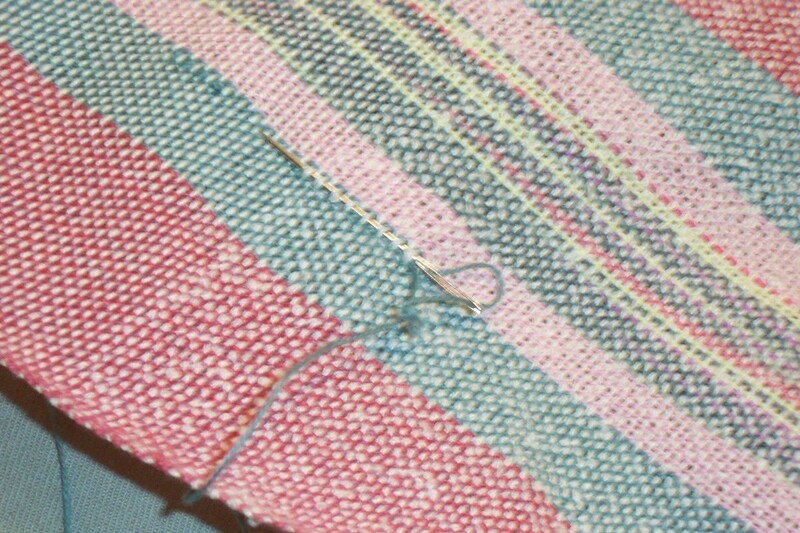 After cutting the towels from the loom, I got out my trusty blunt nosed tapestry needle and carefully followed the path of the end with the needle, then threaded the original end into the eye and pulled it through. The ends were clipped flush with the cloth and the join/overlap is barely noticeable. After wet finishing, the join should be nearly invisible. Always do such repairs before wet finishing. Before it goes through the water the threads are still individual and it is much easier to see the path of the threads through the web. After wet finishing it is much more difficult to do this sort of repair. Really happy with this rose (mostly) towel warp. I only have enough of the rose slub to weave four towels so the rest of the warp will be woven with natural white. It is just day 3 of the new year and already it's looking very promising. :) This morning I had a long conversation with someone and between us we agreed to work on a couple of fairly major projects. I can't say more now because there are many a slip betwixt cup and lip and it may all go away as being impractical. But the thought of either, let alone both, of these projects has put a real spring in my step. It has also given me the impetus to finally tackle my excess weight so instead of just moaning about it, it is time to actually do something about it. I am sure my body will thank me in the end - or at least my feet, ankles and knees will be much happier! 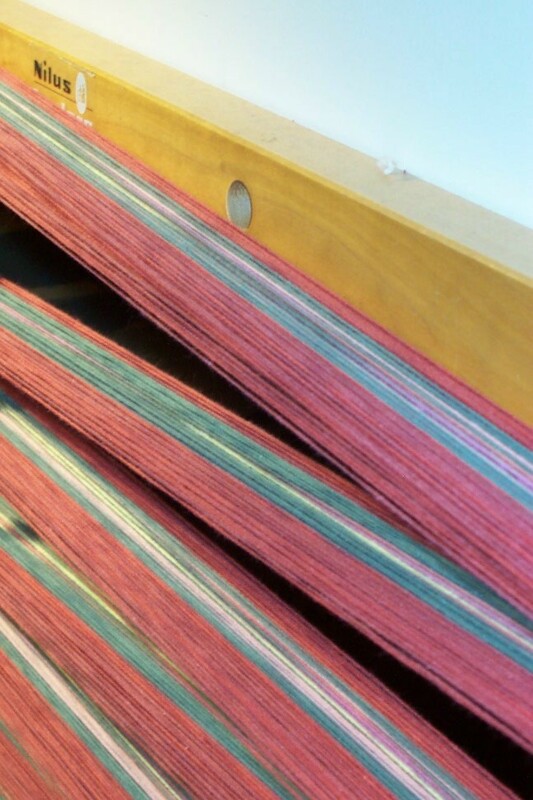 But I wound this warp today and have a blue/pink one ready to wind tomorrow. Not sure I'll beam the warp tonight as I've put in a pretty full day already. It was just that much of it wasn't weaving. 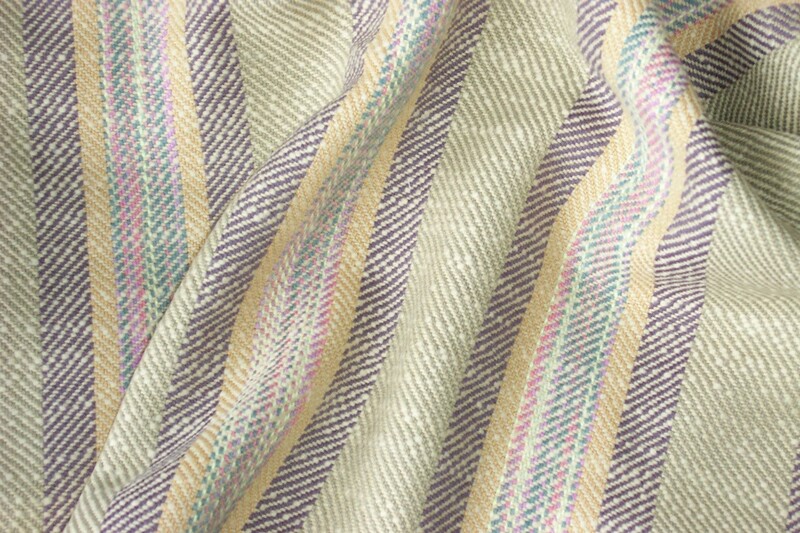 The fabric for the designer and the proposed article for Handwoven are both in the mail. My accountant is open this week so I'll drop my papers off to her tomorrow, and file my sales tax form. 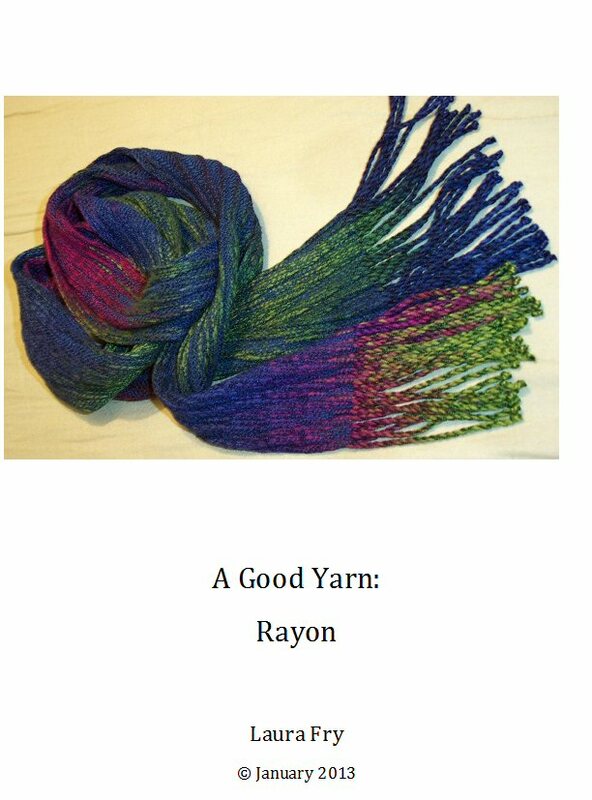 Other than packing, and maybe collating AGY:Rayon, that's about it for the stuff that I really wanted to do before I left. So I feel able to just go ahead and enjoy playing with colour with these towel warps. It's actually been good to force myself to only work from the stash because I have wound up using some combinations I wouldn't have used if I'd had different coloiurs readily to hand. I don't make resolutions at the beginning of the year. New year resolutions seem so....in the face of how many are made and forgotten before the week is out...tenuous. Instead, I found myself today making a decision. With Doug retiring and us needing more income I'd seriously thought of being a lot more aggressive in terms of seeking out opportunities to teach. But today I decided that I was going to leave things as they are. Rather than send my resume and workshop info out to guilds across the continent, I am going to just let anyone interested in my coming to teach contact me. I know this is a bit iffy. I've just had an example in the last week of two emails having gone astray - emails that were pretty important. :( So I know that email contact isn't guaranteed and I may miss some opportunities because of that, but so be it. 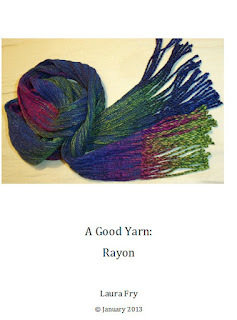 A Good Yarn: Rayon is all but complete. I'm just letting my editor do her job and send the files back to me. The stapling is complete. I still have to design the cover but I'm pretty sure I know what I want to do - it's just a matter of opening Word and fussing with it for a few minutes and see if that idea works. If not I'll need to take more photos and try again. 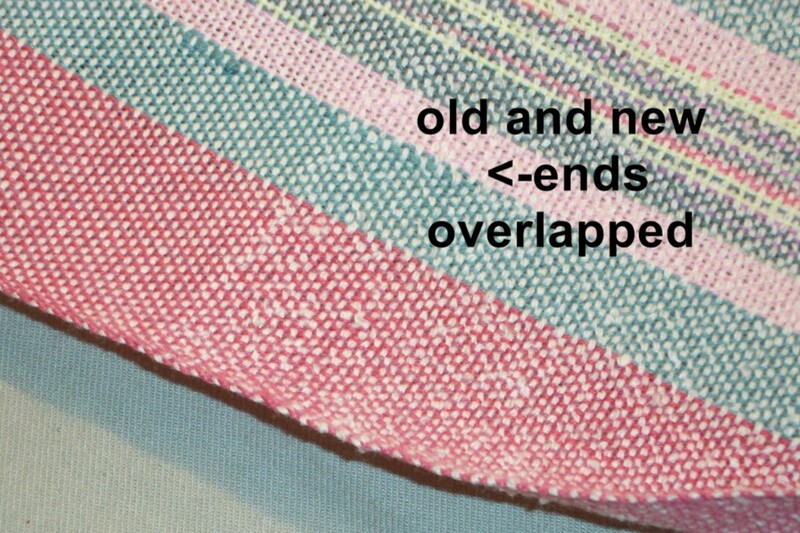 The proposed article for Handwoven is all but complete. Still have to generate the two weaving drafts, print everything out and copy everything to a cd then package everything up and mail. The cloth for the designer is done. Just have to measure it, generate an invoice, package and mail. The tour is as complete as I can make it - in spite of not getting one of the crucial emails with details. A phone call finally put things to rights - or at least as right as they can be. I'm sure there will be a bit of juggling to be done once I'm on the ground. This trip has turned out much more extensive - and therefore complex - than initially thought, requiring a lot more time than I'd expected getting the details sorted out. A good lesson for future bookings. 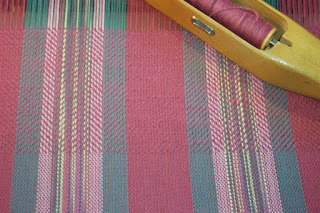 Things are under enough control that yesterday I dressed the loom with another 'short' warp for towels that I'd wound a few days ago. 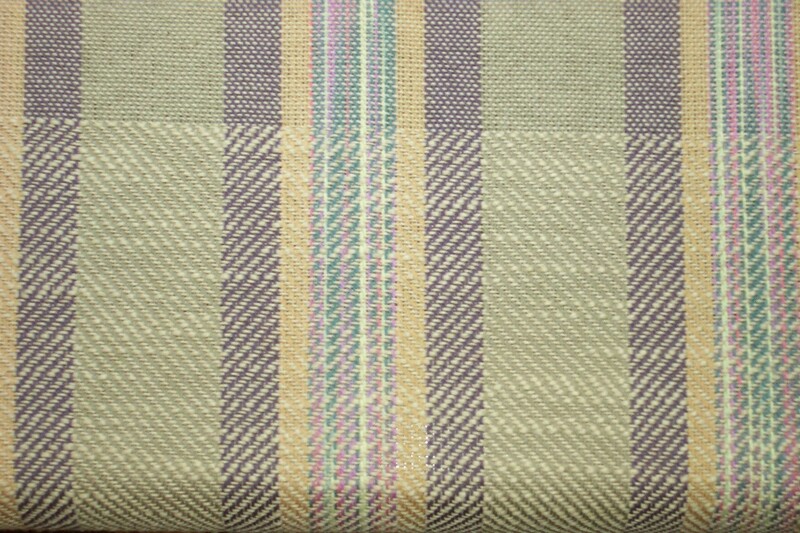 Today I finished weaving that and started dressing the loom with the next. As I sat at the loom threading I thought about how peaceful I felt. A peace that has been lacking the past 4 months. 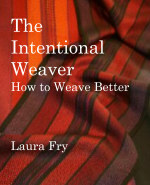 I thought about how much I loved being at the loom, handling the thread, watching the cloth grow. And I realized that I wanted that peace in my life as much as possible. Which meant not trying to find more out of town teaching, but to somehow generate an income from home. And so I will plough ahead with #3 of the A Good Yarn series. The next one will be on linen (flax) and hemp. I expect to spend some time with my yarn catalogue in the next few days so that I can order the yarn to come in while I am away and be able to start weaving the samples as soon as I am home. You see I'm planning a trip to Sweden (hej Kerstin!) and my friend has a big cold mangle. I can take some of the 'after' samples with me and mangle them properly with her big cold mangle.